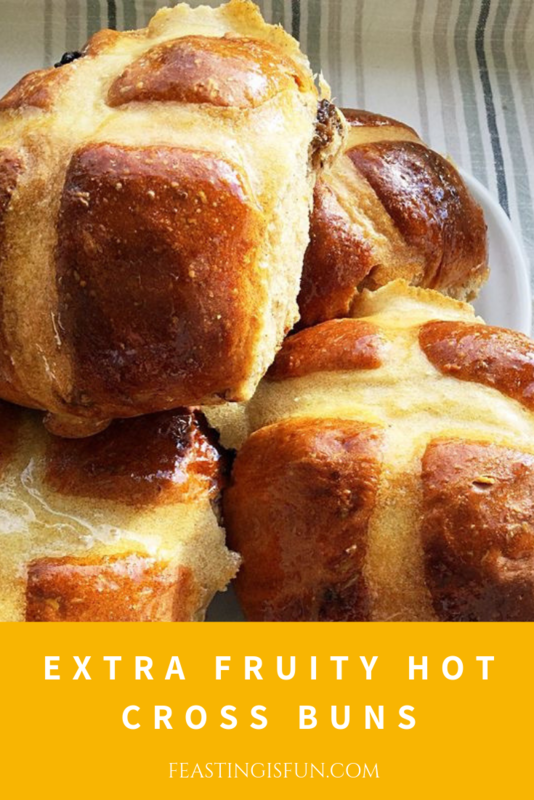 These Extra Fruity Hot Cross Buns really do take the humble, yet delicious and traditional Easter Bun to another level. As their spiced aroma escapes the kitchen, it fills the whole house with warmth. Turning a house into a welcoming home. While neighbours, out in their gardens, stop, wondering whose house the aromatic aroma originates from. 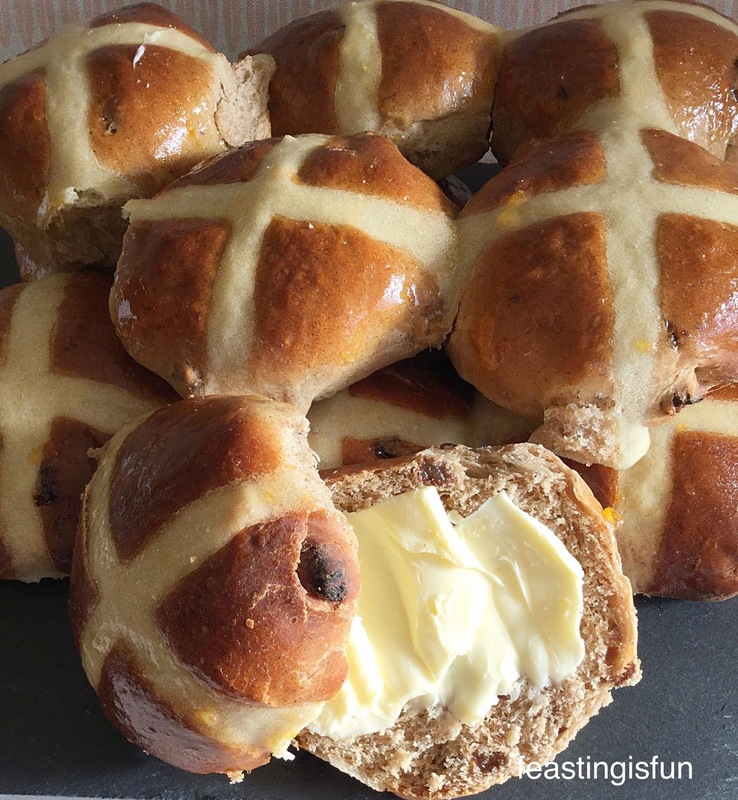 Easy to make and bake, these Extra Fruity Hot Cross Buns are so worth the little effort required. These are not the small, pappy, squidged into a ball, cheap supermarket versions. 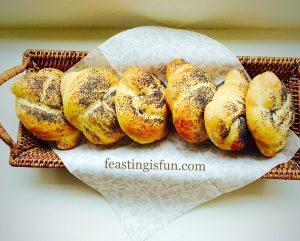 Instead they are filled with fruit, in a good sized bun, that also contains a small amount of wholemeal flour. Indeed, one bun is a substantial breakfast. Extra Fruity Hot Cross Buns deliciously good for you. 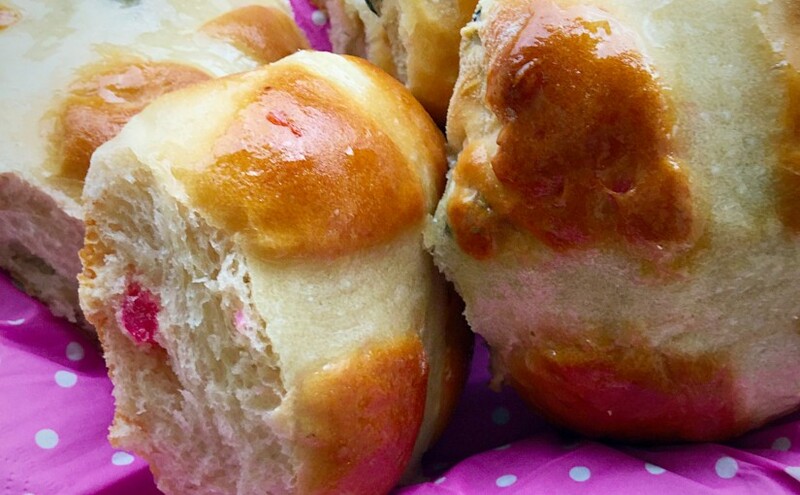 Since these Easter buns are homemade, we know every ingredient they contain. Yet, what they don’t have is any artificial ingredients. Also they work out much cheaper to make, than bought ones. Plus, the extra smell when you split and toast them, is priceless! The absolute thrill for me, when developing a new recipe, is my family’s reaction. Good or bad, I know it can be trusted. Words like “yummy”, “can I have another one please?” and “have you taken the photographs yet?” all feed into my sense of recipe security. As I’m going to be sharing the recipe with my readers, it needs to be robust and reliable. 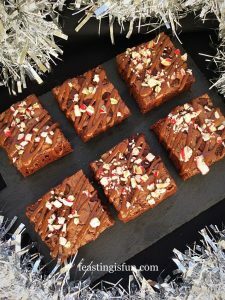 Hence only tried and tested recipes make their way on to this blog. 50g/2oz Plain White Flour and 50mls Tap Water for the crosses. Into the bowl of a stand mixer add the water, milk, eggs, honey and yeast. Next, on top of the liquids add the strong white and wholemeal flour. Then add the salt and butter. Fit the stand mixer with a dough hook and then lock the bowl into place. Lower the dough hook and start mixing on a slow speed. Continue mixing at this speed for 5 minutes. After 5 minutes has elapsed gradually increase the mixer speed to moderately high. Again mix for a further 5 minutes, then stop the mixer and lift the dough hook. Remove a small piece of dough and stretch it until you can see light through it. This is known as the windowpane test. If the dough tears continue mixing, checking every couple of minutes until it passes the windowpane test. Once it has finished kneading, turn the speed on the mixer to low and add the spices and fruit. Mix for a further 2 minutes to incorporate the fruit and spices. 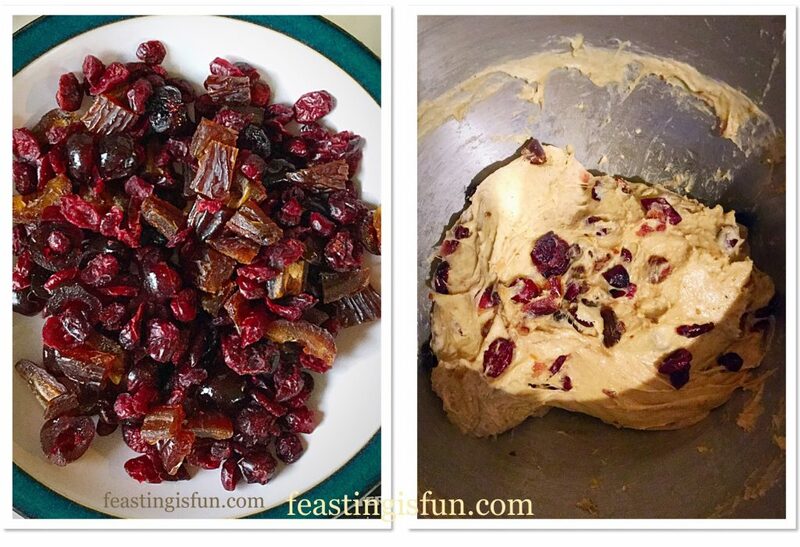 Following this, stop the mixer, raise the dough hook and scrape any dough into the bowl using your fingers. Unlock the bowl, cover with a clean tea towel and place somewhere draught free. The dough has more than doubled in size. Tip the dough out on to a lightly floured surface, it will be quite sticky. Knead the dough lightly to form a ball and then weigh it. I place baking parchment on flat, digital scales. Note the weight and then divide it by 12, leaving the parchment on the scales. Now cut the dough in half. As each bun is weighed this doesn’t have to be exact. 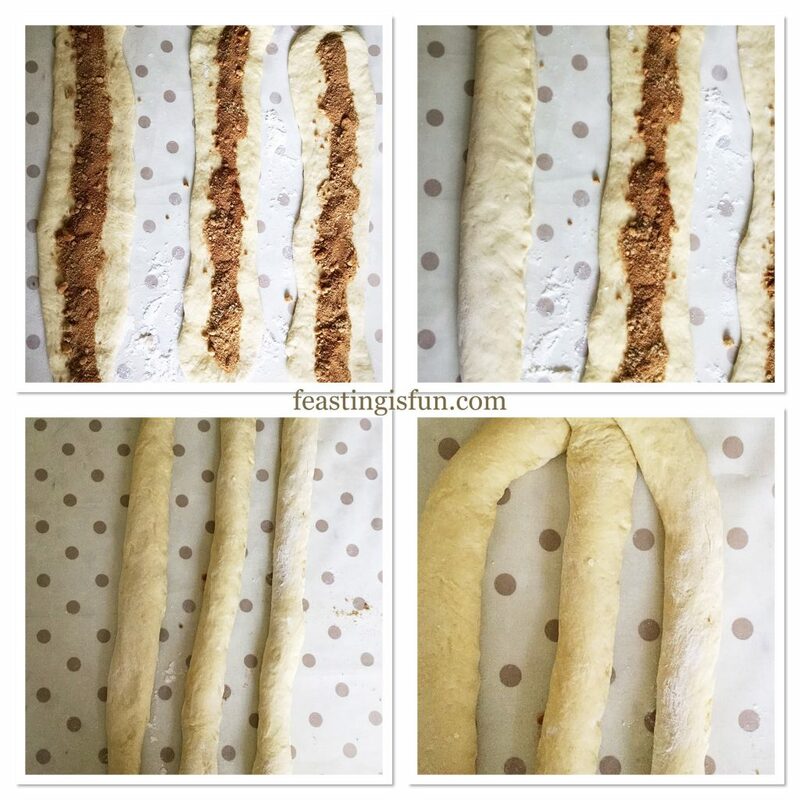 Follow by forming each dough half into a log shape. Cut each dough log into six. Weigh the first piece of dough and adjust as necessary to obtain the correct weight. Hold the dough in one hand while using the other to turn and tuck the underneath in, creating a tight ball shape. Place the ball on to the baking tray. Continue until all 12 balls have been made. Cover the tray with a clean tea towel and place in a draught free place until doubled in size. 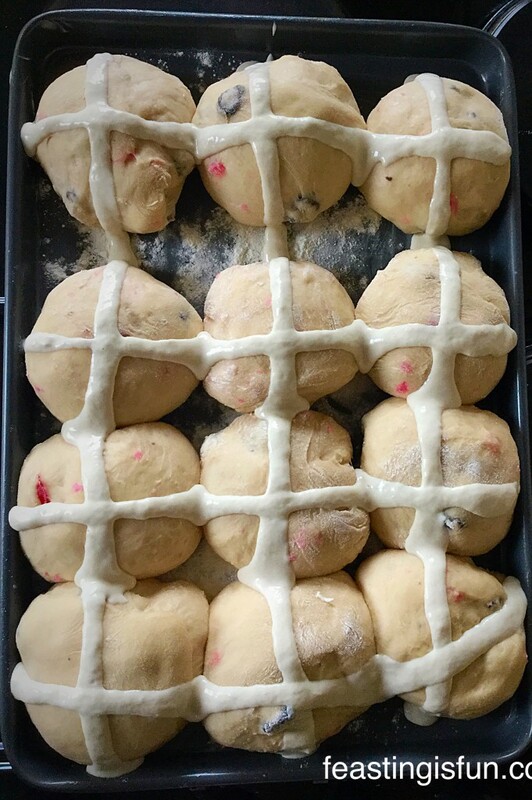 While the buns have their second prove, make the paste for the crosses. Place the flour and water into a bowl, mix until lump free. Spoon the white flour paste into a small piping bag, secure the top with a peg/rubber band and stand the bag in a glass until needed. Preheat the oven to 220C/200C fan, gas mark 7. Once doubled in size, snip off the very end of the piping bag. Pipe straight lines of paste. First of all piping across the tray and then down the tray. Pipe each separate row continuously for neat crosses. Bake in the preheated oven for 25-35 minutes. When baked they will be golden brown and sound hollow when rapped on the base with a knuckle. Once baked remove from the oven. Remove the buns from the tray on to a cooling rack, with a clean baking tray underneath. Measure the honey and water into a small microwaveable bowl. Heat in the microwave until bubbling. Remove carefully as it will be hot. Stir the honey and water to mix. Use a pastry brush to cover each hot bun in honey. 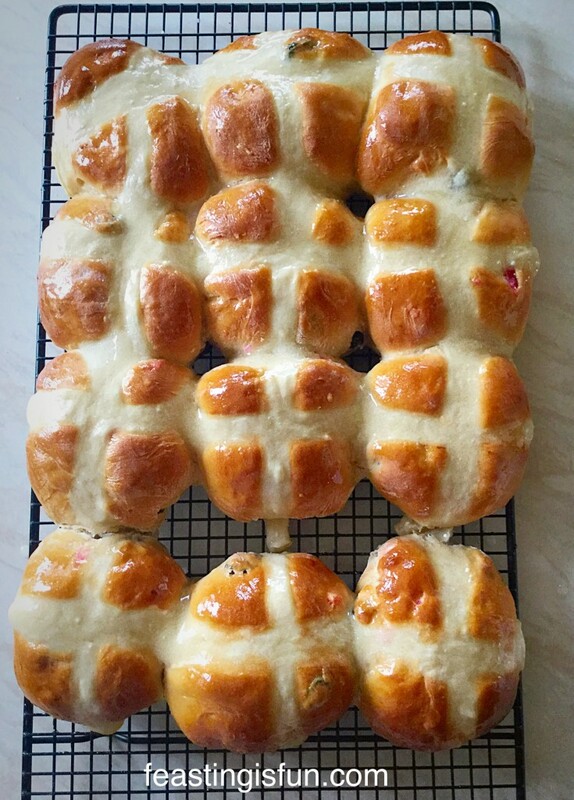 Sticky, cooling, Extra Fruity Hot Cross Buns. Wait for the buns to cool before eating. Then serve as is or toasted and buttered with a big smile. 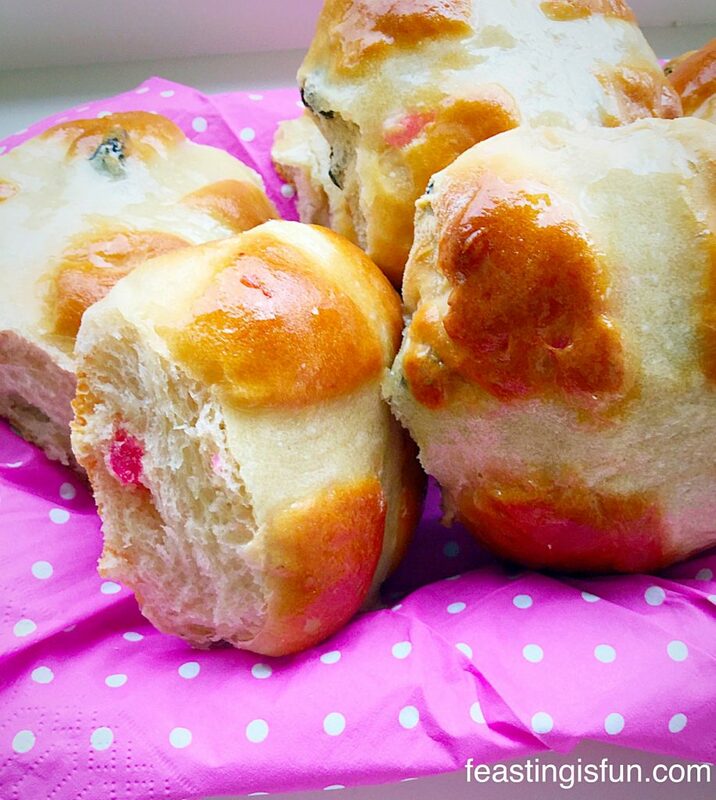 Extra Fruity Hot Cross Buns delicious fresh from the kitchen. The buns will keep for 3 days if toasted. Also they freeze extremely well for up to one month. 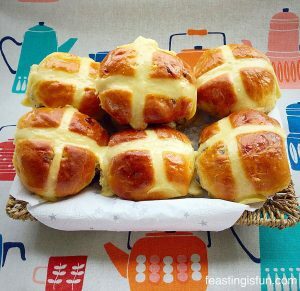 It would be very easy to double up on this recipe and share homemade Extra Fruity Hot Cross Buns with friends, neighbours and family over the Easter period. If you are a frequent visitor to this blog, you will know how much I enjoy making bread. While I am very happy to let kitchen appliances carry out the hard work, indeed for this loaf they are necessary, shaping the dough is always fun to do by hand. 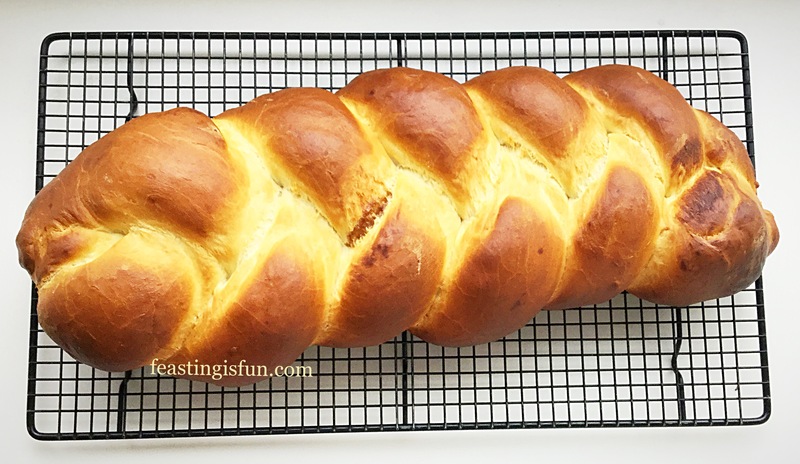 Since I first tried an eight strand plaited loaf last year, I have become hooked on intertwining lengths of dough and observing the final, baked result. This Cinnamon Plaited Brioche Bread is delicious and easy to make. 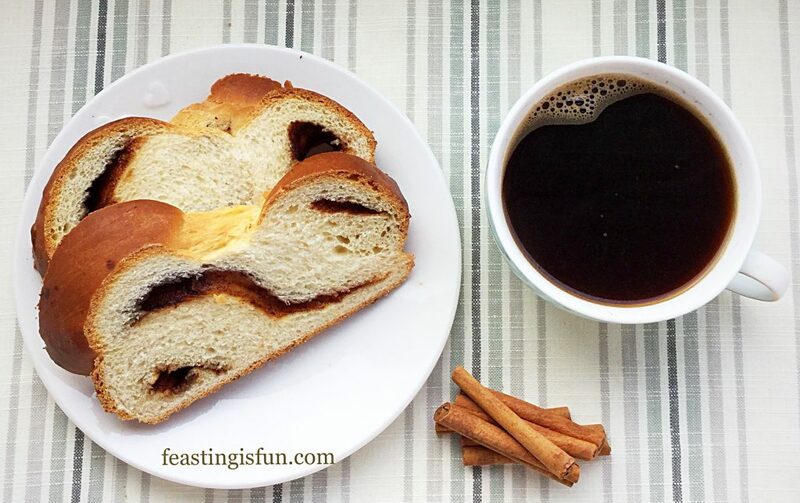 Cinnamon Plaited Brioche Bread a delicious breakfast. Having re-tested the recipe and technique I have full confidence that you too can make this delicious bread. Even if you have never plaited before, the step by step photographs will show you how. Such a small amount of extra effort and you will be rewarded with a stunning loaf. While the smell of cinnamon dough, baking, will have you counting the minutes until your first slice! 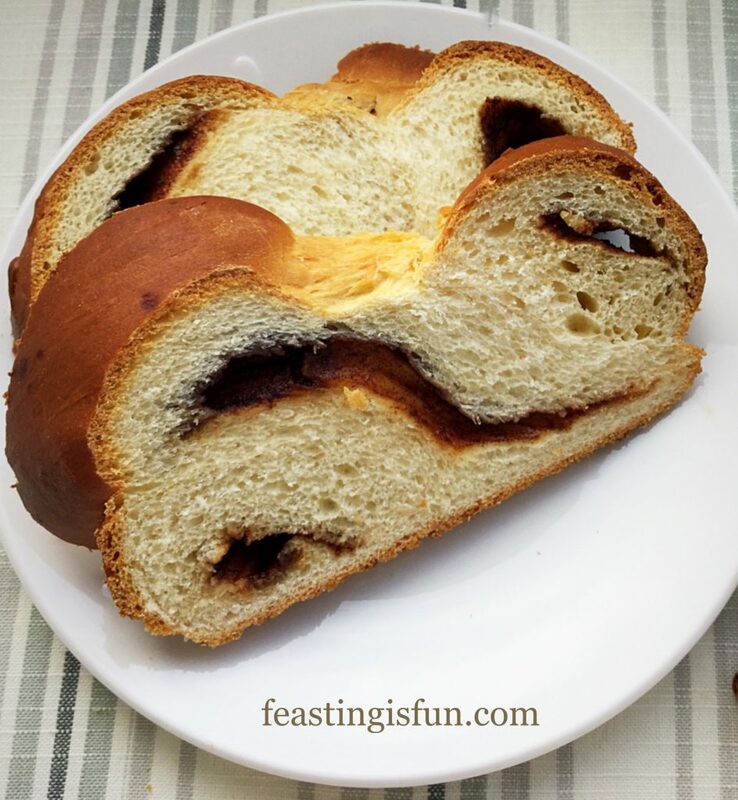 Cinnamon Plaited Brioche Bread golden and bronzed with a hidden inner. When baking, it always pays to use the very best ingredients available. However, not everyone’s budget can stretch to premium ingredients. If you can make one change here, I strongly recommend using free range, or organic eggs. Their golden yolks are what help give this loaf its amazing colour. Both in the bread itself and the egg wash, brushed on before baking. Resulting in both the golden and bronzed baked crust. 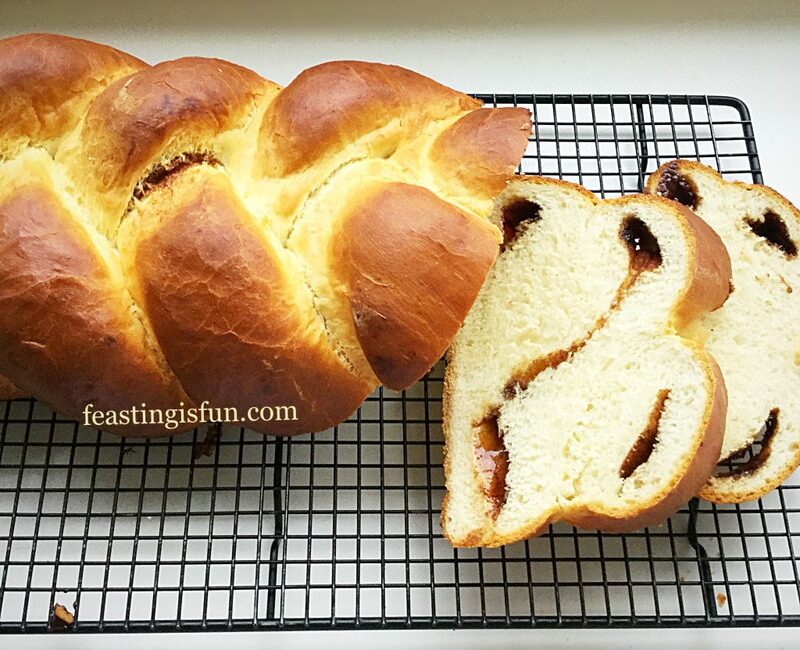 Cinnamon Plaited Brioche Bread beautiful inside and out. 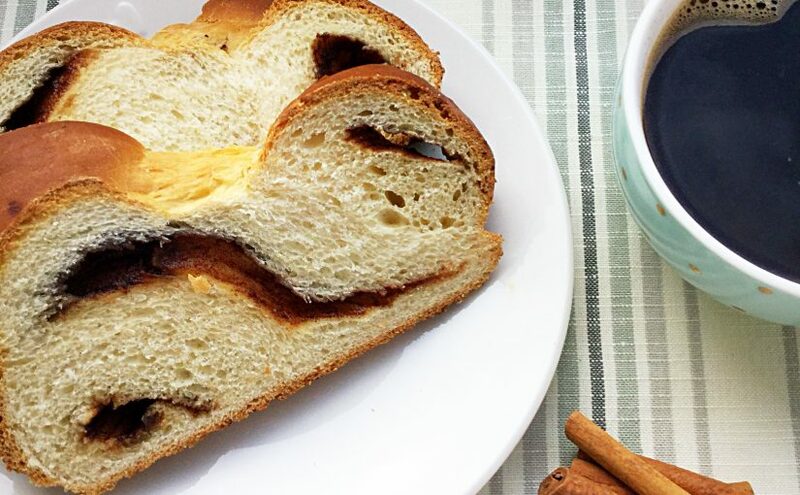 Serving this bread, sliced for breakfast or as an afternoon treat with a hot drink, is sure to brighten anyone’s day. Since it is a large loaf, why not take it to work, pre-sliced and share with your colleagues? Since all food tastes better when it is shared, that is the only way to improve this bread. Simply by sharing it. 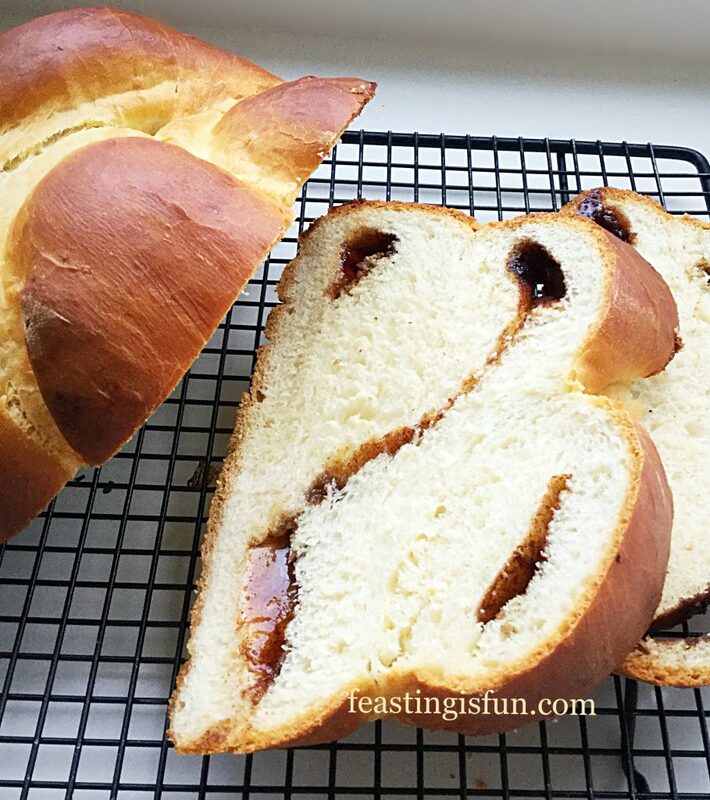 Cinnamon Plaited Brioche Bread simply delicious. 1 free range egg plus 1tbsp milk to brush over the loaf. 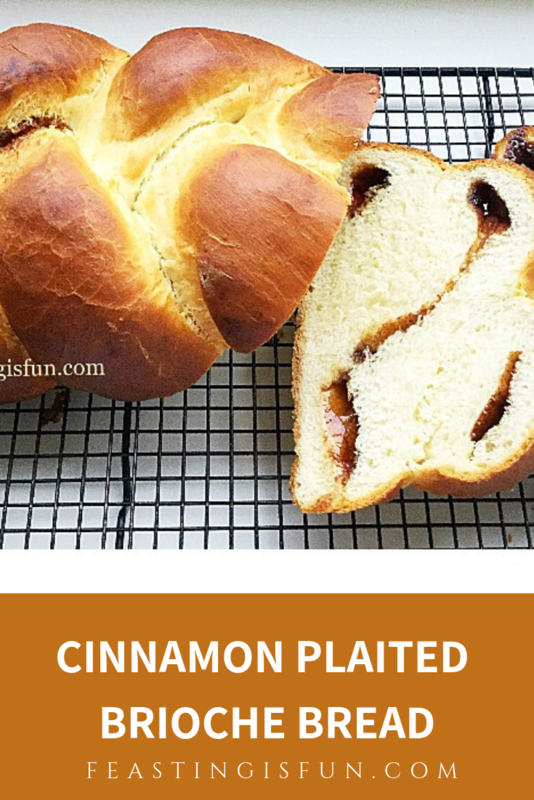 The method given for making this Cinnamon Plaited Brioche Bread uses a dough hook fitted to a stand mixer. The enriched dough is very, very sticky, prior to its first prove. Using a stand mixer ensures that the dough is kneaded properly. Resulting in a light textured crumb once baked. First of all ensure that your kitchen is warm. It will really benefit the yeast, during the dough making process. Measure the milk into a jug and warm in a microwave for 20 seconds. Ideally the milk should be body temperature 37C. However, do not overheat as it may kill the yeast. Pour the milk into the bowl of a stand mixer. Crack 2 eggs into the jug and add these to the milk in the bowl. I always break eggs into a separate container first. If any shell escapes it can then be removed and also, extremely occasionally, should an egg be bad, it will not spoil the whole recipe. Next add the sugar and yeast. Swish the liquid about with clean fingers to break up the eggs and mix lightly. On top of the liquid mix add the flour. Now add the butter and salt. Lower the dough hook into the bowl and mix on the slowest speed for 5 minutes. Then, gradually increase the speed to medium and mix for a further 5 minutes. After the mixing time has elapsed stop the mixer. Remove a small piece of dough and stretch it between your fingers. The dough is kneaded when it can be stretched so thinly that light can be seen through it. This is called the windowpane test. If the dough tears before it can be fully stretched, lower the dough hook and continue mixing, checking every 3 minutes, until it passes the windowpane test. Once the dough passes the windowpane test it is ready to prove. Scrape the dough from the dough hook and allow to drop into the bowl. Cover the bowl with a clean tea towel and place somewhere warm and drought free. Allow the dough to prove until doubled in size – approximately 1 hour. 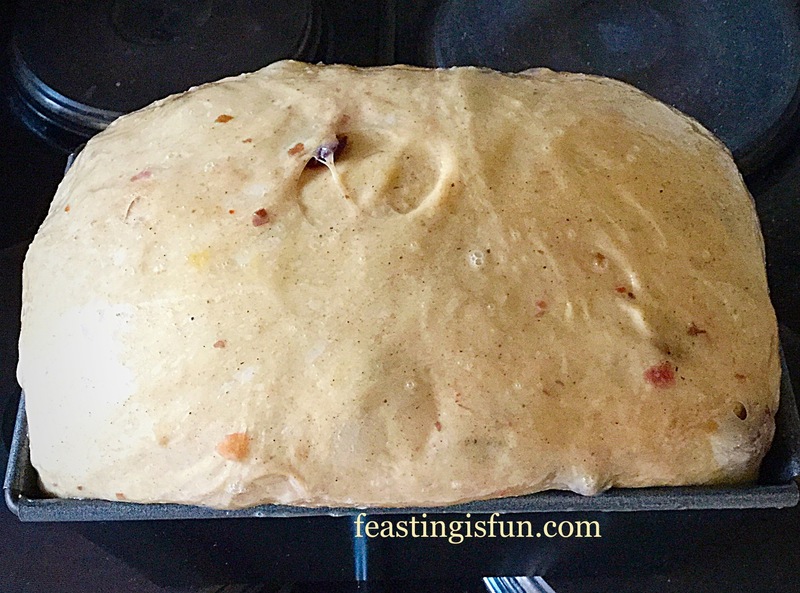 While the dough is proving grease a large baking tray with butter. Also, into a small bowl, weigh out the sugar and add the cinnamon. Stir to mix and break up any large sugar lumps using your fingers. Set to one side. Once doubled in size turn the dough out on to a lightly floured surface. Use your hand, or a dough scraper to remove all of the dough. Shape the dough into a round and then weigh it. I use digital scales, placing the dough on to a piece of baking parchment. Make a note of the weight of the dough. Now divide that figure in 3. Cut the dough into 3 pieces that are equal in weight. 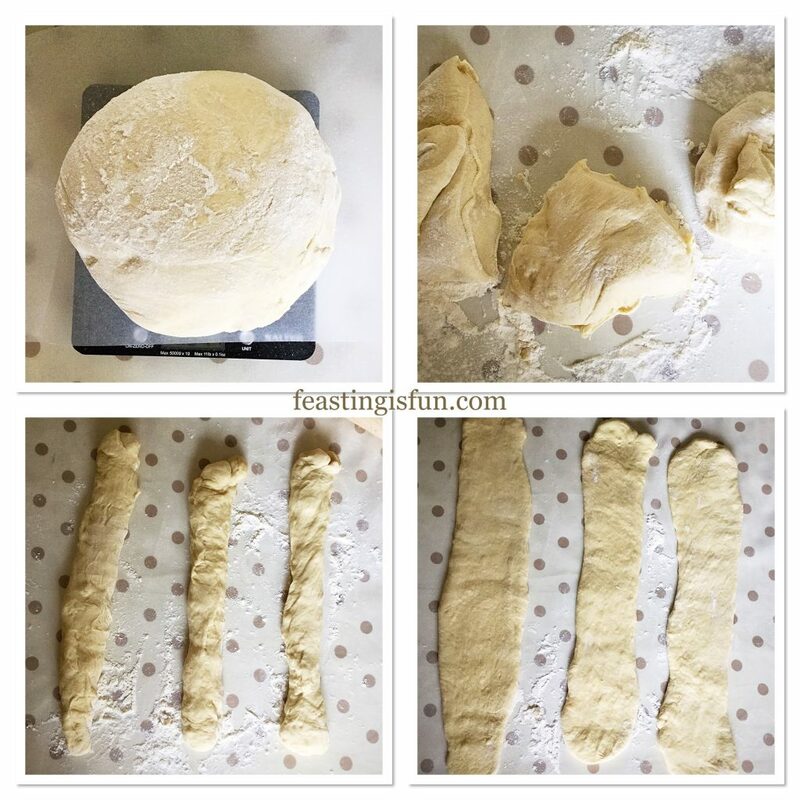 Roll each piece of dough into a length and then flatten, using your hands or a rolling pin. Each flattened length of dough should measure 50cm/20″. Preparing three dough strands for the cinnamon/sugar filling. Sprinkle the sugar/cinnamon mixture down the middle of each piece of dough. Dividing it equally between three strands. Dab a little tap water down the right side of the first strip of dough. Now bring the left side over and pinch to secure the sides together. Similar to making a sausage roll. Continue until all three lengths of dough have their filling securely encased. Roll each length of dough so that the join is underneath and not visible. Join all three lengths of dough at the top. Place on top of each other and pinch together to secure. Filling, securing and attaching the top of the plait. Starting from left to right, number the strands 1, 2 and 3. Number 1 strand will always be to the left, 2 in the middle and 3 on the right. Pass strand 1 over strand 2. Now pass strand 3 over strand 2. Ensure the strands are not pulled tight and there should be no gaps. Pinch the bottom 3 strands together so that they are secure and look tidy. 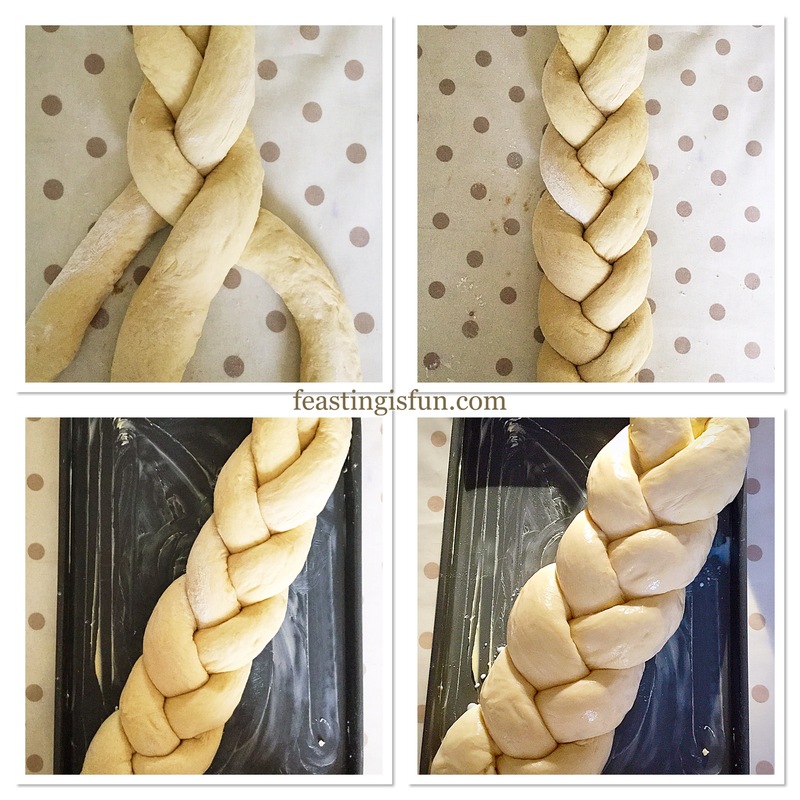 Lift the plait using both hands at either end and place diagonally on to the greased baking tray. Cover with a clean tea towel and leave, as before, in a draught free place. While the plaited dough is proving preheat the oven to 240C/220C gas mark 9, 475F. Break an egg into a bowl, add the tablespoon of milk and whisk with a fork to mix. Once the plaited dough has doubled in size use a soft pastry brush and carefully brush the egg wash over. Plaiting and placing the brioche on to a baking tray before the egg wash.
Place the egg washed Cinnamon Plaited Brioche Bread into the centre of the preheated oven and bake for 10 minutes. Then reduce the oven temperature to 220C/200C fan, gas mark 7, 425F. Continue to bake for a further 15-20 minutes. The bread is baked when a deep, golden crust has formed and the base sounds hollow, when rapped with a knuckle. Once baked remove the bread from the oven. 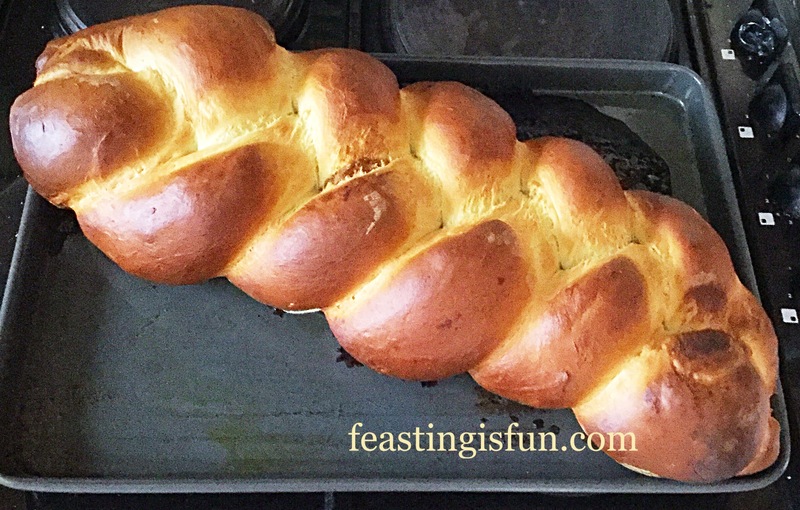 Beautifully baked Cinnamon Plaited Brioche Bread. Slide a pallet knife under the baked bread, then carefully transfer to a cooling rack. Cinnamon Plaited Brioche Bread cooled and sliced, revealing the hidden centre of each strand. Allow the loaf to cool to body temperature before slicing. Attempting to slice while the bread is still hot will compact the bread. Also eating freshly baked, hot bread, is not good for our digestion! Serve sliced with a smile and a complimenting drink. Placed in a bread bin, or wrapped loosely in foil, once fully cooled, this loaf will last up to three days. It can be toasted, although I’d advise not to use a toaster due to the sugar present. 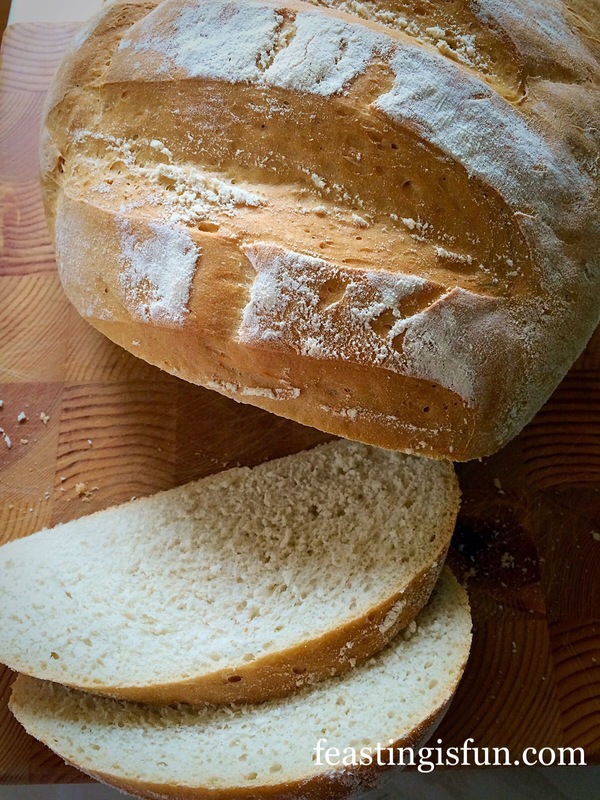 Under a grill, or even better, in front of a log fire, this bread makes excellent toast! Homemade bread is the most luxurious food, for me, to bake. Enticing smells as it is baking, make our house feel like a home. Appreciative comments when a fresh loaf is on the table, to be served with dinner, or for breakfast, make me smile. Not for the accolade, or indeed achievement, from others, of having made my own loaf. Simply the fact that I am giving my family, delicious, additive free, tasty bread, is enough to keep me baking. What do you really enjoy cooking and baking? Who do you like to share it with? Christmas is only four weeks away and I am thoroughly enjoying the build up. Especially when it comes to creating new recipes to share with you here. Food is a big part of our Christmas, with tradition dictating our ham is cooked on Christmas Eve, as well as fresh sausage rolls and mince pies. 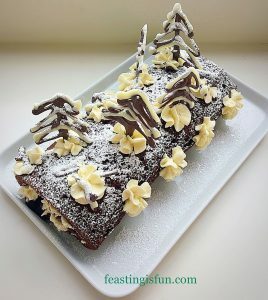 This year there will definitely be a Christmas Spiced Fruit Loaf on offer for breakfast on the big day itself. Filling the house with scents of Christmas spice, as it is sliced and toasted. 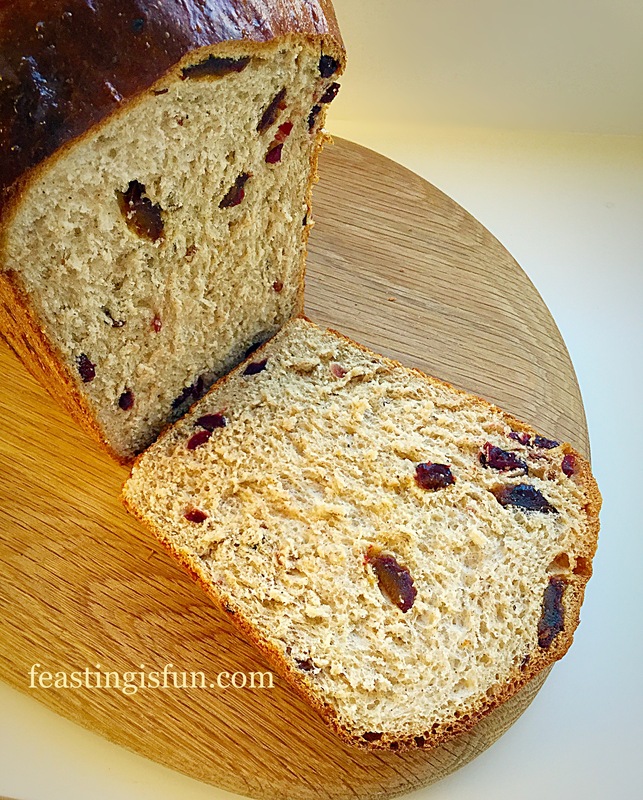 Christmas Spiced Fruit Loaf delicious toasted for breakfast. 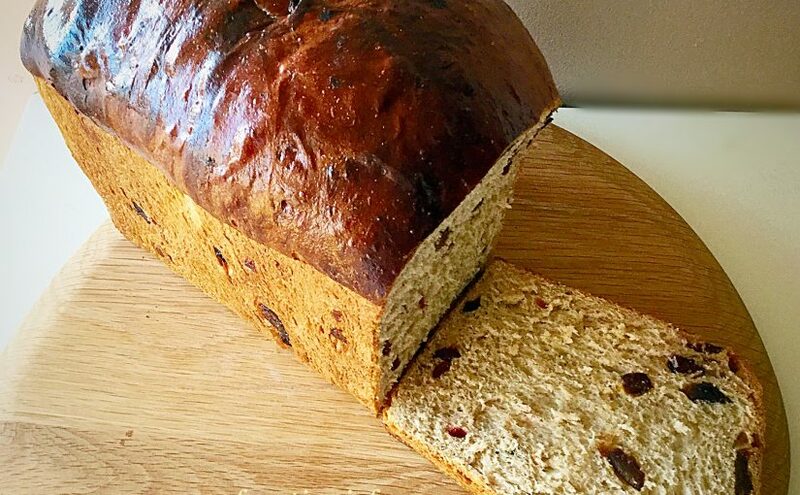 Packed full of dried fruits including dates, cherries and cranberries, in a brioche style loaf. The added milk, eggs and butter used in a Brioche give it a wonderfully soft crumb. Perfect for eating sliced as is, or toasted and slathered in butter, this loaf really does smell and taste of Christmas. 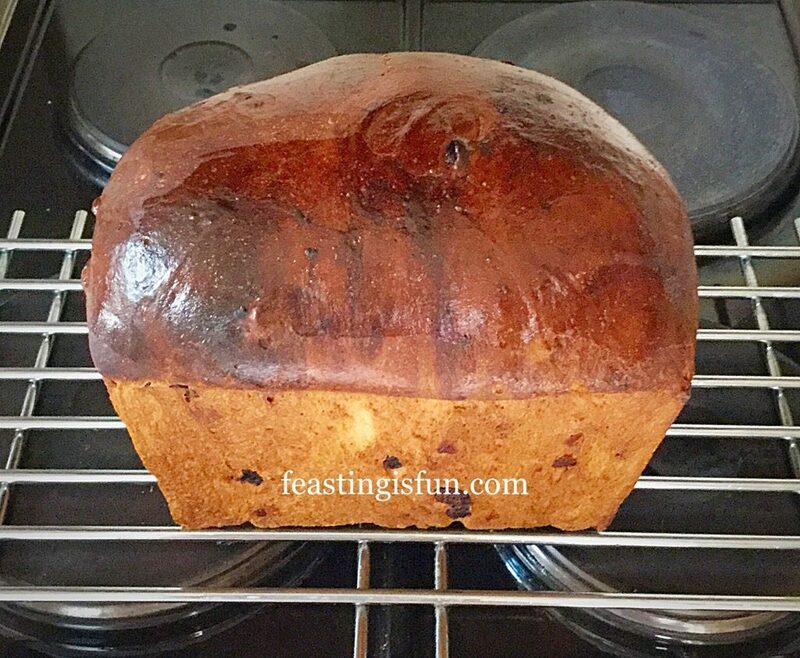 Christmas Spiced Fruit Loaf egg wash gives the bronzed, glossy top when baked. Using the best Medjool Dates from The Medjool Date Company, certainly enhances the taste of this loaf. While sweeter than my Spiced Fruit Loaf, it does not hold back on the Christmas spices of Cinnamon, Ginger, Nutmeg and Allspice. Resulting in the most amazing aroma, filling the kitchen and then the house, as this beautifully bronzed loaf bakes. 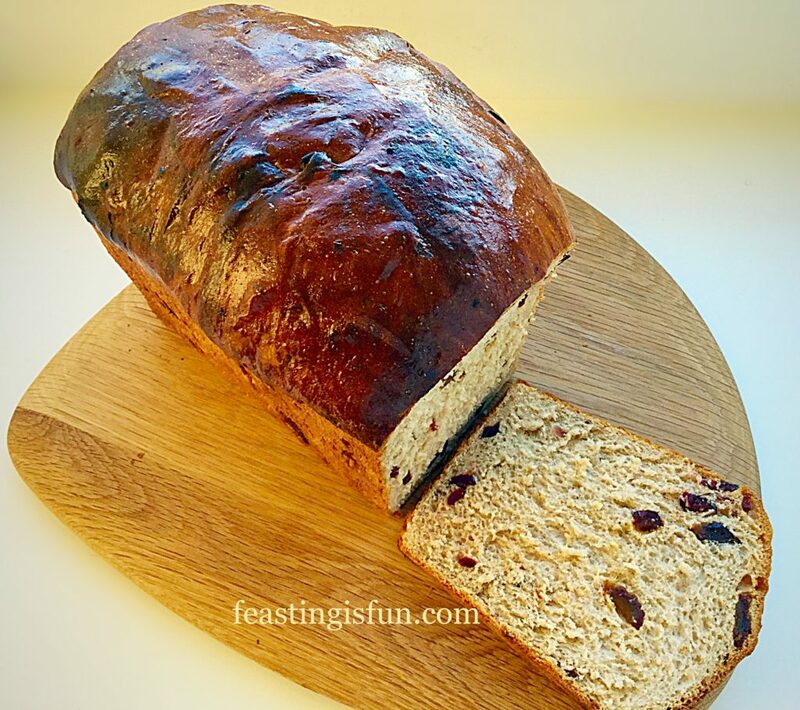 Christmas Spiced Fruit Loaf perfect with a cup of tea mid afternoon. Baked in the British Bakeware, 3lb Farmhouse Loaf Tin, this fruited bread never sticks. 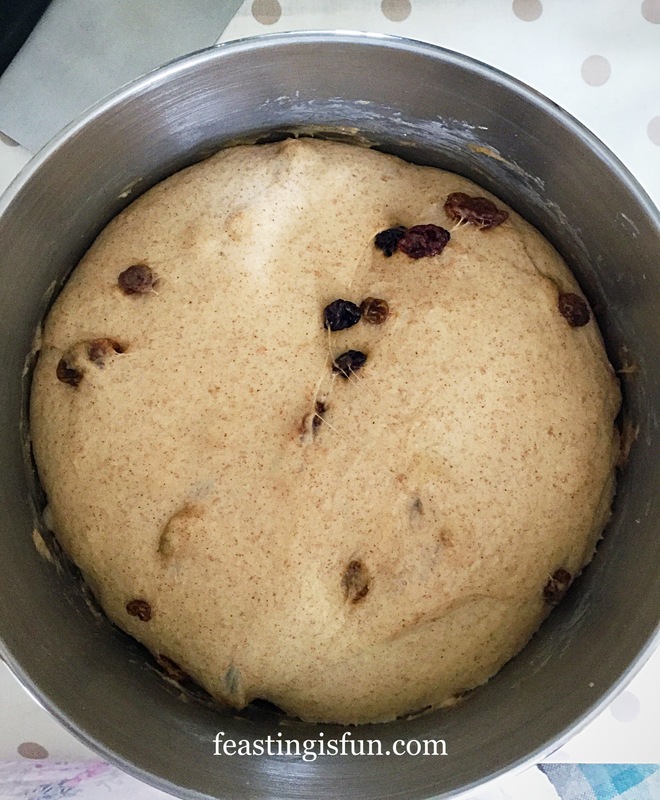 The deep sides of the tin ensure the dough is supported as it rises. Resulting in an evely risen loaf, without a muffin top. The advantage being, a great shaped loaf that is easy to slice and the slices fit in the toaster. Without exception, this loaf tin is my most used and treasured piece of kitchen bakeware. 100g/4oz Medjool Dates – I like The Medjool Date Co.
A stand mixer was used to make and knead the dough for this loaf. You may choose to make this by hand, however, the dough is incredibly sticky. A mixer is recommended. First of all, measure 320mls of milk into a microwaveable jug. Zap on full power for 20 seconds. Stir and check the temperature, it should be the same as body temperature. Into the slightly warmed (not fridge cold) milk add 2 whole eggs. The volume should be 350mls. Tip away any small excess of milk. Pour the milk and eggs into the large bowl of a stand mixer. Next add the sugar and yeast. Stir with a sooon to break up the eggs and mix the ingredients. Now add the flour, on top of the liquid ingredients. This forms a barrier so that the yeast does not come into direct contact with the next addition, salt. Add the salt and cubes of butter. Fit a dough hook to the stand mixer and mix on a slow speed for 10 minutes. While the dough is mixing prepare the fruit; remove stones from the dates and cut in half, cut each half into four pieces. Next cut each glacé cherry into quarters. Place the cranberries, cherries and dates in a bowl together. After 10 minutes of mixing, stop the mixer and lift the dough hook. Remove a small piece of dough and stretch it. The dough is properly kneaded when it can stretch, without tearing, thinly enough to see light through it. This is called the windowpane test. If the dough tears, lower the dough hook and continue mixing for a further 2 minutes, after which test it again. Once the dough passes the windowpane test, add the fruit and spices. Lower the dough hook and mix again on low speed for a further 2 minutes. After the fruit is incorporated stop the mixer and lift the dough hook. Use clean fingers to scrape the dough from the hook and place it in the bowl. The prepared fruit and dough ready for it’s first prove. Cover the bowl with a clean tea towel and place it somewhere warm and away from draughts. Now leave the dough to double in size. NOTE: The presence of spices will slow down the action of the yeast. Therefore, the dough may take longer, up to 2 hours or more, to double in size. While the dough is proving thoroughly grease a 3lb deep farmhouse loaf tin with butter. When the dough has at least doubled in size, scrape it out on to a lightly floured surface. Press the dough into a rough rectangular shape. Now fold the bottom third up and then fold the top third down, so that it slightly overlaps the previous fold. Finally, tuck either end under, so that you have an oval-ish shape. Place the shaped dough into the buttered loaf tin. Cover with the same tea towel as before and leave, as before until doubled in size. While the dough is proving preheat the oven to 220/220 fan, gas mark 8. Once the dough has doubled or even trebled in size, remove the tea towel. Using a pastry brush lightly brush over the egg wash.
Christmas Spiced Fruit Loaf ready for the oven. Now place the loaf carefully into the centre of the preheated oven. Bake for 10 minutes before reducing the oven heat to 220C/200C fan, gas mark 7. Continue baking for a further 20 minutes and then remove the loaf from the oven. Turn the loaf out on to a cooling rack. Rap the base of the loaf with your knuckle. The bread is baked if the rapping produces a hollow sound. If not, place the loaf, on its side back in the oven and check every 5 minutes until it is fully baked. Christmas Spiced Fruit Loaf fresh from the oven. 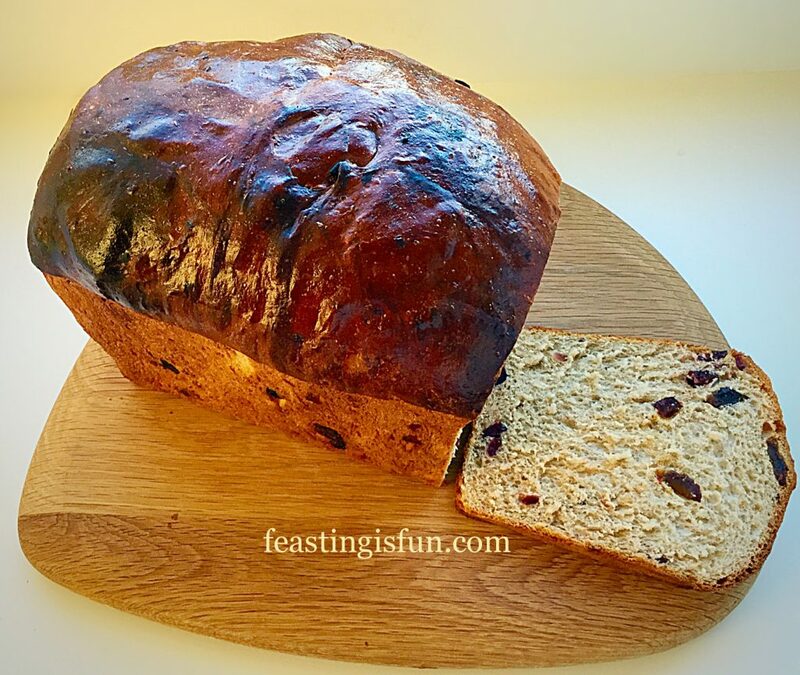 Allow the Christmas Spiced Fruit Loaf to fully cool before slicing. This fruited loaf will last for 3 days in a proper bread bin. Serve sliced, as is, or slice and toast for a delicious, fruit and spice filled breakfast. Snowy Black Forest Roulade – with GLUTEN FREE option. Since you are setting the stand mixer up to make this fruited loaf, why not double up the ingredients and make two loaves? Sharing is inherently part of Christmas. I can think of no better reason, than to give one loaf away. 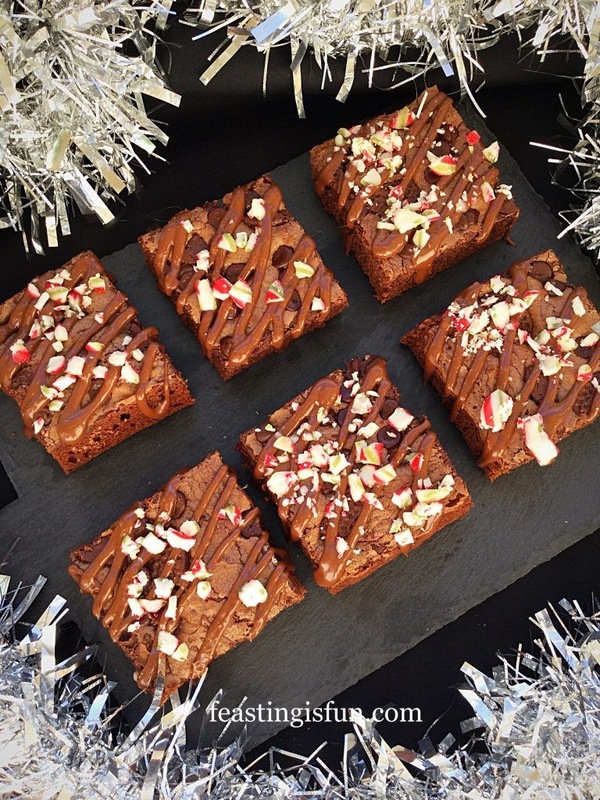 Surely anyone would be happy to receive the gift of a freshly baked, Christmas Spiced Fruit Loaf! Whatever you are making, baking and creating in your kitchens, have fun and remember food always tastes better when it’s shared. 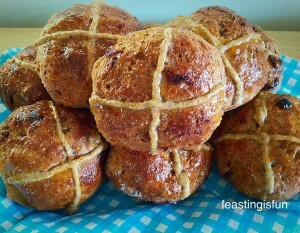 Easter is nearly here and with it the traditional Hot Cross Buns, which I absolutely love. However, after seeing Waitrose selling a variety of different flavours, I decided to take on the Cherry Bakewell Hot Cross Buns. 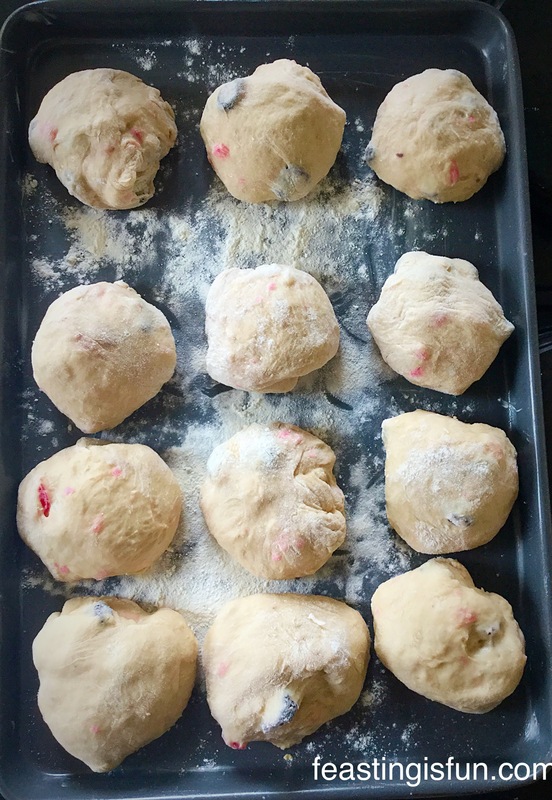 I wanted to use the basic egg and milk enriched dough from my traditional Hot Cross Buns and experiment will cherries and almond flavouring. As much as I absolutely love all things almond, especially flaked almonds, I decided to keep them out of these Cherry Bakewell Hot Cross Buns. 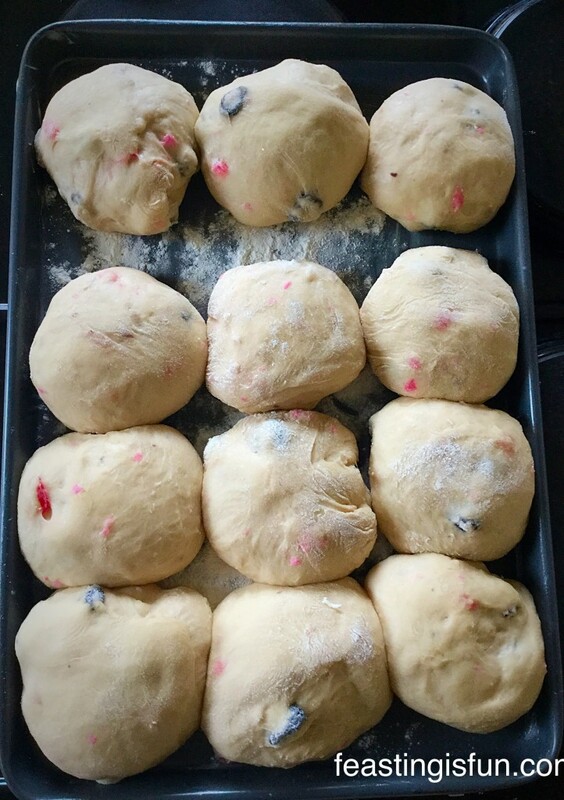 I wasn’t sure how they would interact with the dough and I still wanted the buns to have a soft, pillowy, interior. Leaving out the almonds was a great decision. These Cherry Bakewell Hot Cross Buns are so light and very more-ish. Crunch would not have been a good thing! Instead I used Sugar and Crumbs cherry bakewell icing sugar. Substituting it both for the honey in the dough mix and using it to glaze the buns, instead of apricot jam. This with the addition of some almond extract, gave the buns just the right hint of almond. The flavour is subtle and works so well with the fluffy, light bun. Now for the cherries. I used both glacé and dried cherries. 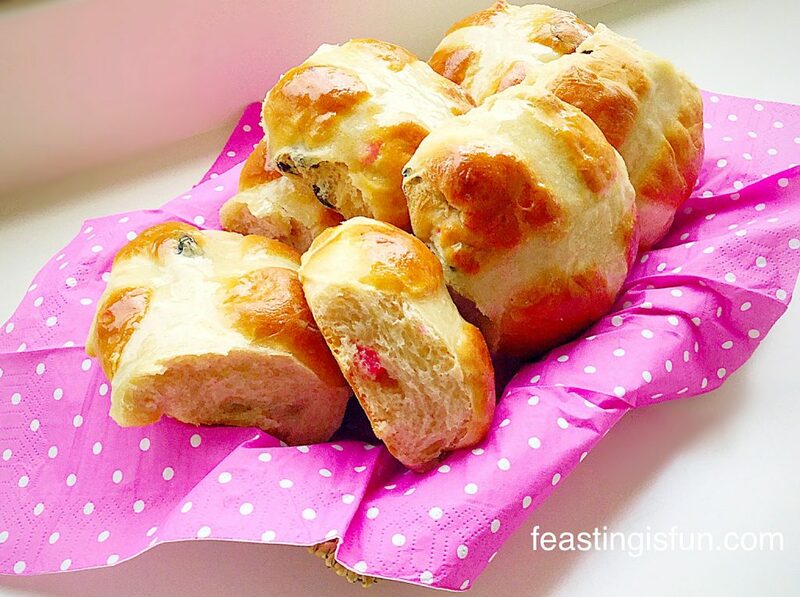 They both add their own flavour and pretty colour to these Cherry Bakewell Hot Cross Buns. The dried cherries also give a lovely chewiness, similar to that of raisins. While the glacé cherries add bursts of sweetness, similar to that of mixed peel (of which I am most definitely not a fan!). 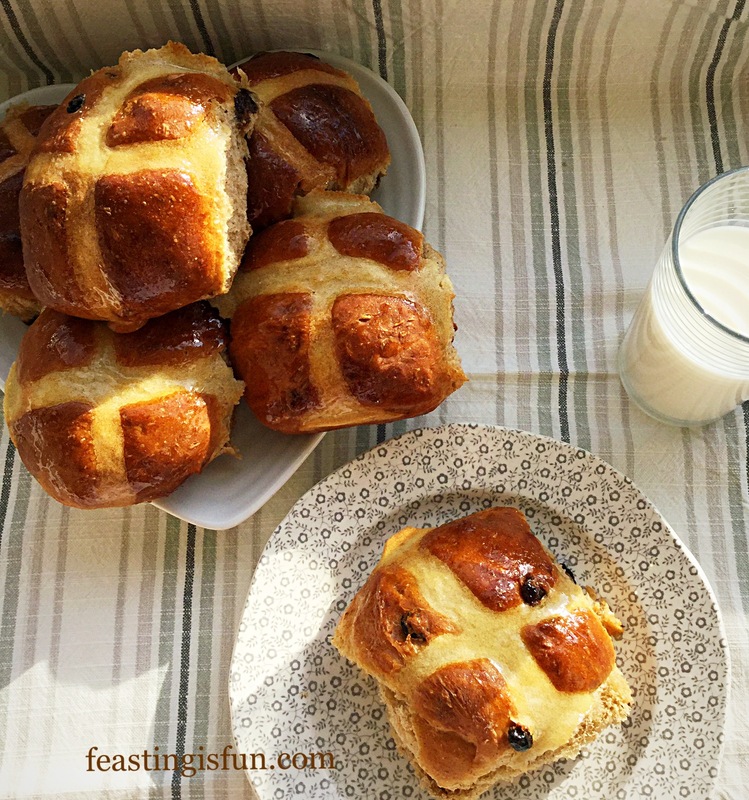 Over all these Cherry Bakewell Hot Cross Buns have been a huge hit in our home. So much so, that I can see myself making them all year round, although I’ll probably leave off the cross! They are an utterly delicious bun, not dissimilar in taste to old fashioned, bakery, iced buns. Perfect toasted with butter, or eaten, as I did, just like an iced bun, with a lovely cup of tea. If you haven’t made bread dough before, or used yeast in baking, please don’t be daunted by the prospect. Ensure the yeast you use is fresh. Yep, even fast action dried yeast, which is what we use in this recipe, loses its potency. So if you have yeast that’s been sitting in the cupboard for more than 6 months I really would recommend buying new. I bake regularly enough to get through a tin of fast action dried yeast, every 2-3 weeks. It’s a regular on my grocery order. Don’t worry if all you can by is sachets, that’s fine as we weigh the yeast for this recipe. Likewise with flour, you need good strong, white, bread flour. I buy mine from Shipton Mill via Amazon UK. It works out a lot cheaper than buying the best organic supermarket brand. That said, I’ve already mentioned that I bake a lot, so buy a good quality, organic if you can afford it, brand from the supermarket. All flour has a use by date, check yours. The reason I have emphasised using fresh ingredients is, whilst this recipe is relatively easy, it can be heartbreaking to make a yeasted bun, only to find it doesn’t rise. So if you check everything before you start, you are much more likely to have a deliciously, positive outcome. Which is what we all want. Right? 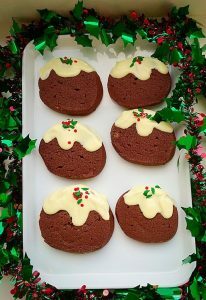 50g/2oz Cherry Bakewell Icing Sugar – or substitute plain icing sugar plus 1/4tsp almond extract. 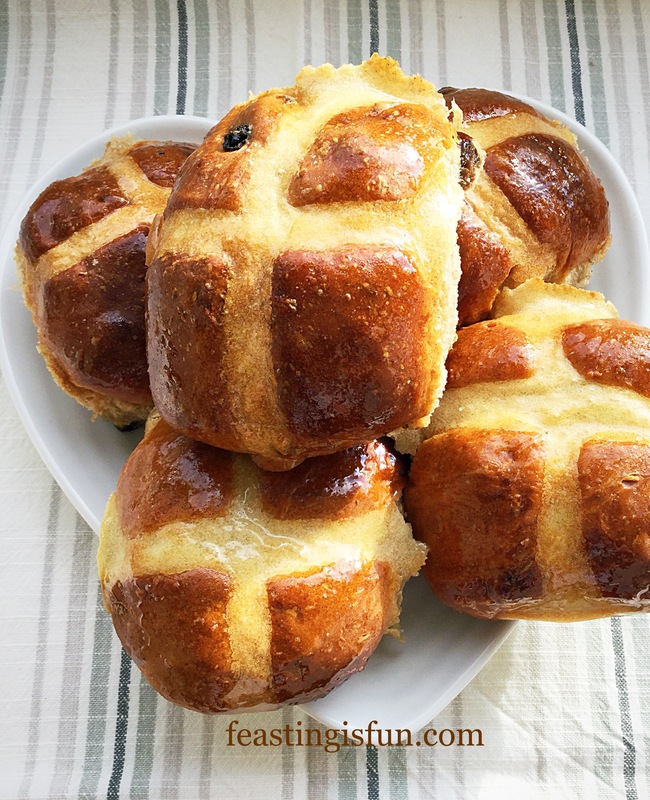 Method: This method is for use with a bread maker or stand mixer, if you wish to make by hand, I suggest you look to the original, traditional hot cross bun recipe in Paul Hollywood’s book ‘How to Bake’ ISBN 9781 4088 19494. The ‘bowl’ refers to the bowl of a stand mixer or the mixing compartment of a bread maker. Add both the milk and water to the bowl. Next add both eggs, the icing sugar and yeast. Swish about with clean fingers to mix. Now add the flour on top of the liquid mixture. Place the salt and butter on top of the flour. For a bread maker, set the cycle to dough and press start. When prompted by the machine, or 5 minutes before mixing stops, add the dried cherries, glacé cherries and almond extract. Allow the bread maker to complete the dough cycle. When the bread maker has completed the dough cycle, ensure the dough has doubled in size, if not wait until it has. Then re start the dough cycle for 2 minutes, this will ‘knock back’ the dough for you. For a stand mixer attach the dough hook. Start mixing on a low speed. Once the contents of the bowl resemble dough continue to mix on medium/slow speed for 5 minutes. Stop the mixer. Scrape all the dough, from the hook, into the bowl. Add the dried cherries, glacé cherries and almond extract. Lower the dough hook and mix on medium speed for a further 5 minutes. After the 5 minutes mixing is complete, stop the mixer. Scrape all the dough back into the bowl, it will be very sticky – don’t worry. Cover with a damp cloth and leave in a draught free place until doubled in size – 1 – 1 1/2 hours. Once the stand mixer dough has doubled in size, lower the dough hook and mix on medium speed for 2 minutes, this will ‘knock back’ the dough for you. Grease a large baking tray with butter – see Hot Cross Buns for full step-by-step pictures. Tip the dough out onto a lightly floured surface. It will be quite sticky, so ensure you have floured your hands well. Cut the dough in half and then cut each half into 6 even pieces. Shape each piece into a ball and place on the baking tray – the dough was very sticky so some of my balls weren’t perfect! Cherry Bakewell Hot Cross Buns ready for their second prove. Cover the buns with a clean tea towel and place in a warm, draught free place. Leave until doubled in size. 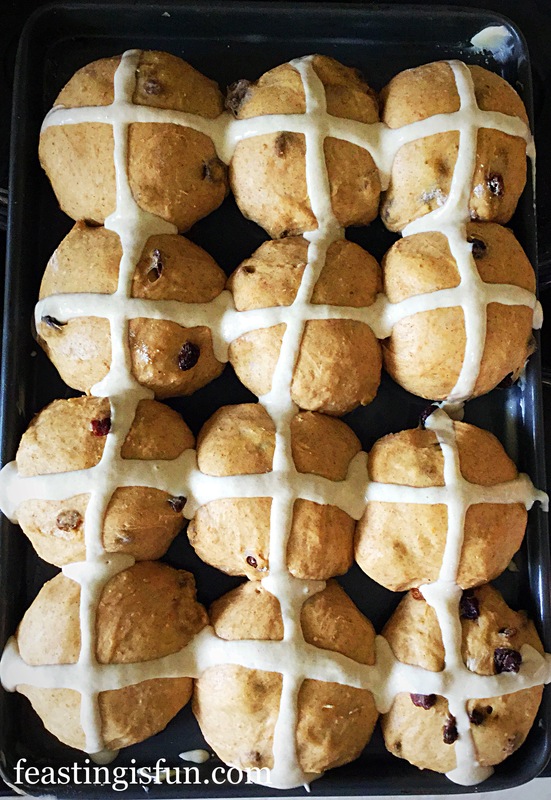 While the buns are proving, make the flour paste for the crosses. Add the water and almond extract to the flour and mix until you have a smooth paste. Place in a small, disposable piping bag and secure the top with an elastic band. 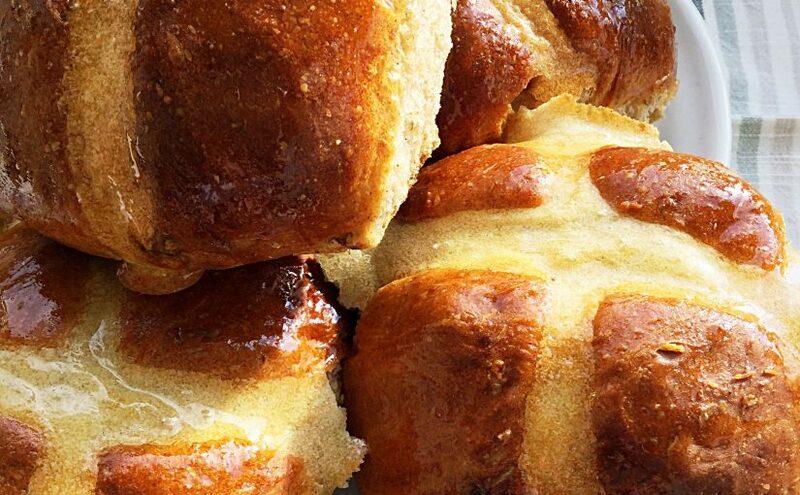 Doubled in size and almost round, these buns are ready for their crosses. 10 minutes before the buns are ready for the oven, preheat it to 220C/200C fan, gas mark 7, 425F. Snip the end off of the piping bag, so there is a small hole. Pipe down each line of buns and then again across each line of buns. Place the buns into the middle of the oven and bake for 20 minutes. They are baked when they are golden brown and sound hollow when rapped on the bottom with your knuckle. Remove the Cherry Bakewell Hot Cross Buns from the oven. 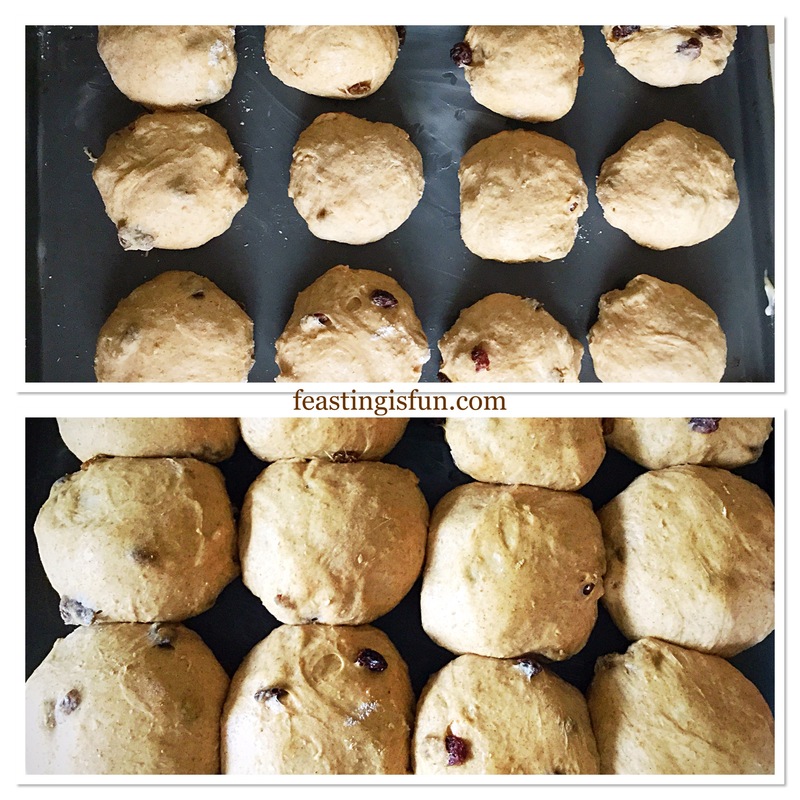 Take the buns off of the baking tray and place onto a cooling rack. Make the glaze by adding the very hot water to sifted icing sugar and stirring until completely dissolved. Brush the glaze over the buns whilst they are still hot. Leave to cool until at least warm, before diving in and taking your first bite! 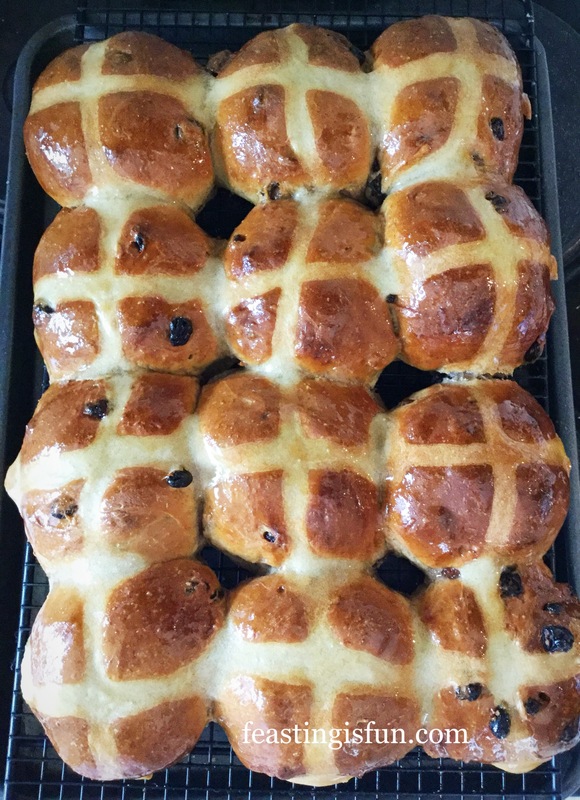 Cherry Bakewell Hot Cross Buns glazed and cooling on a rack. 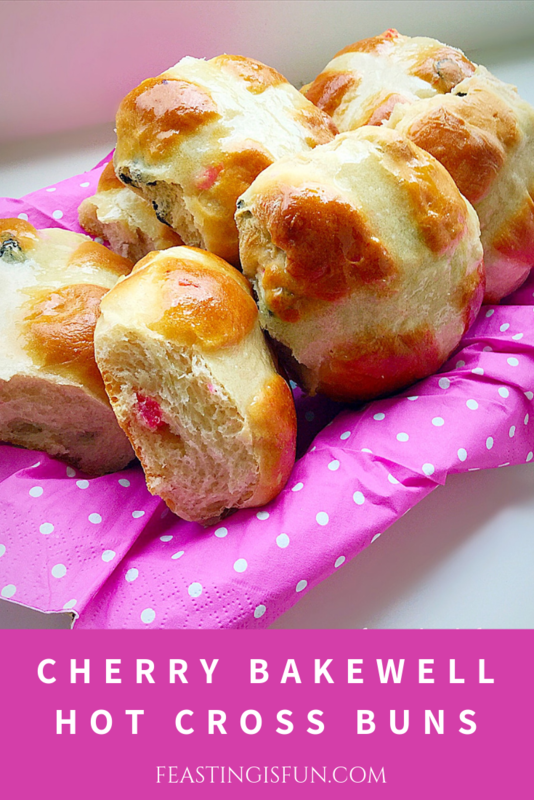 These Cherry Bakewell Hot Cross Buns may not have the traditional taste of the usual buns, but they are a complete and utterly delightful alternative! 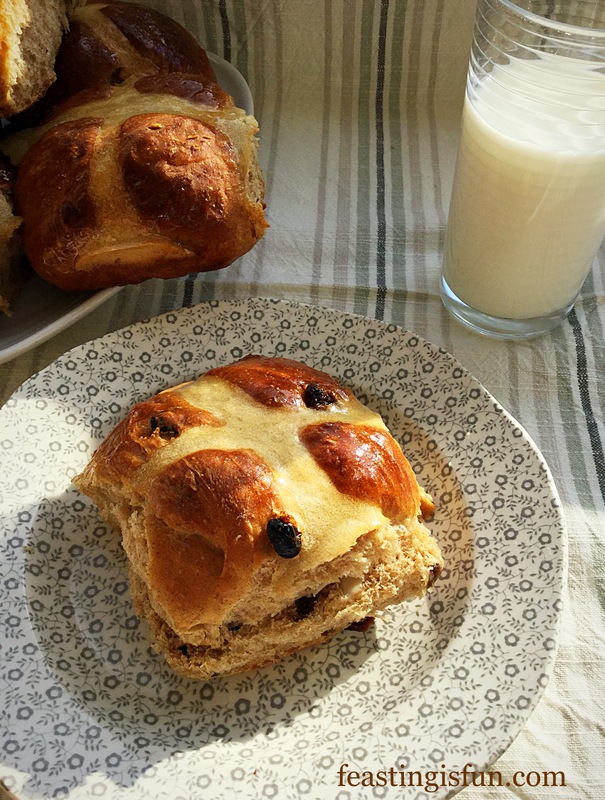 For those people who are averse to raisins, sultanas or cinnamon, here is a bun they can thoroughly enjoy in the run up to Easter. In fact all year round. Have you ever tried making hot cross buns? 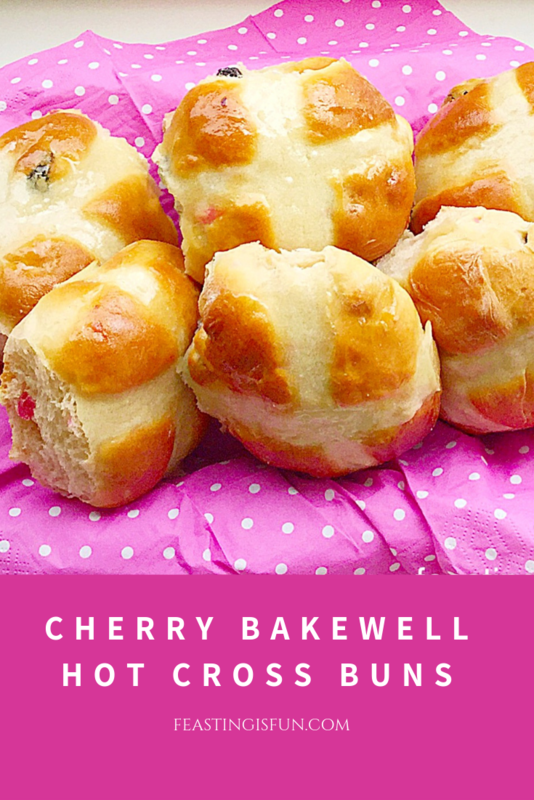 Do you like the idea of the Cherry Bakewell Hot Cross Buns as an alternative? 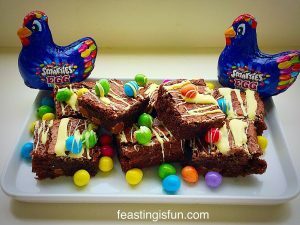 I hope you have fun whatever you bake this Easter and also take a moment to consider what Easter really means, see Important Stuff. 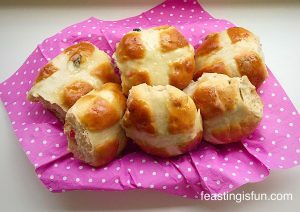 If you have enjoyed these Cherry Bakewell Hot Cross Buns here are some more traditional recipes for you. 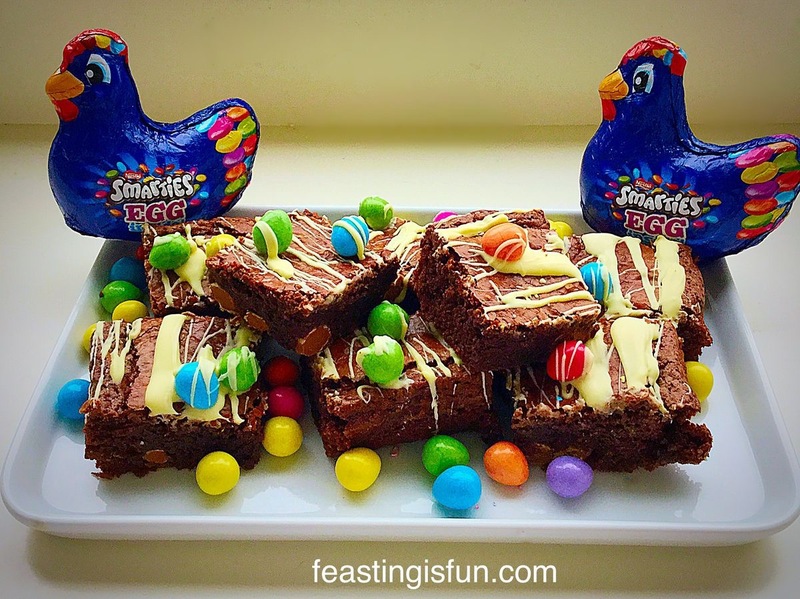 Whatever you make or bake over this Easter period, please pop a photo onto Twitter/Instagram? I love seeing your pictures and reading your comments. Wishing you all a happy, safe Easter. 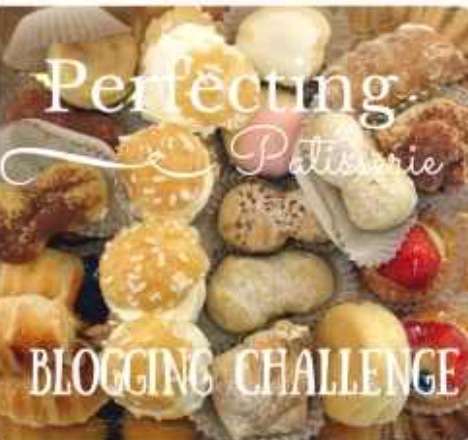 This recipe has been submitted to Baking Queen 74 for March’s Perfecting Patisserie. No part of this post may be reproduced or duplicated without the written permission of the owner. Please seek my Disclosure Policy.